Mark was organizing an international contrabassoon festival, hoping it would become an annual summer event, possibly back-to-back with the annual IDRS convention. As a kickoff, Mark was writing me to commission a recital piece for unaccompanied contra that could be used for competitions. Being a bass clarinetist myself, and very fascinated by the Bach cello suites which balance between vernacular dance rhythms and developed form, I was eager to compose a similarly-conceived dance suite, based on music contemporary to my own vernacular. 1. HUSTLE MISTERIOSO uses a hustle rhythm, and the notes are reminsicent of the "Powerhouse" motif used in many of Carl Stalling's cartoon scores. It also is a traditionally-built rounded binary form. 2. TWIST VARIATIONS uses a theme in driving quarter-notes and 12-bar blues, and then goes quite far afield into many rhythmic and textural worlds, using the 12-bar blues as a chaconne. 3. BEAR HUG is a 12/8 slow dance, certainly inspired by the feel of Smokey Robinson's and other ballads of that genre. 4. FUNK SCHERZO is more free-form, and true to its title. Roger Soren gave the world premiere at IDRS 1997; audio excerpts of that live performance are on the contrabassoon page of this website. Individual movements have been used frequently for audition requirements, and few have dared to play the complete suite in entirety. I've had the rare pleasure of hearing the 1st movement played en masse in unison at a contrabassoon convention. 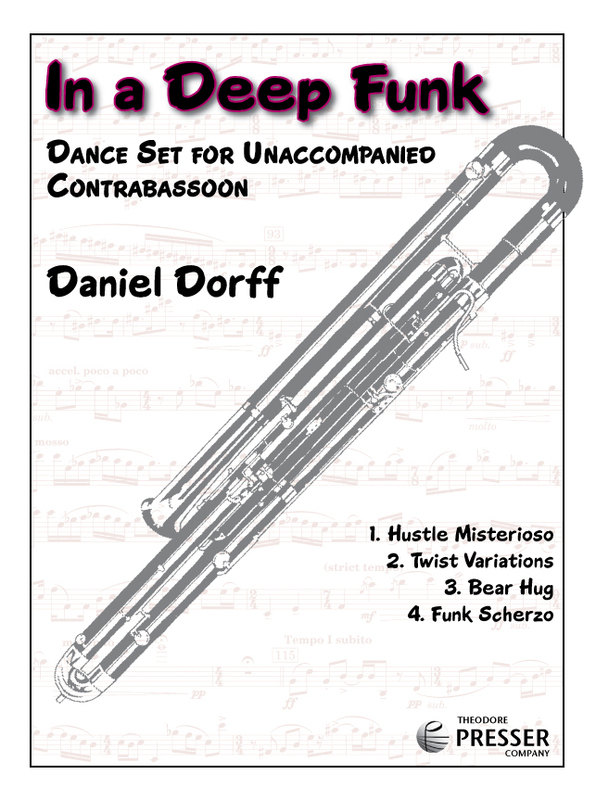 IN A DEEP FUNK is also available for bass clarinet. There is also a sequel, Deep Funk, Pt. 2, for solo viola.